under the small umbrella: Want some Southern Comfort? 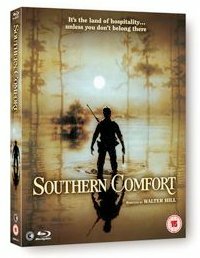 From the director of The Warriors comes one of the biggest cult films of the 80s – Southern Comfort – which makes its Blu-ray debut courtesy of Second Sight Films. Legendary director Walter Hill’s action thriller follows a platoon of weekend soldiers as they embark on routine manoeuvres and end up fighting the battle of their lives. This gripping cult thriller comes to Blu-ray with sumptuous limited edition packaging as well as a DVD release and includes a rare interview with Walter Hill who discusses the film in the 45 minute feature 'Will He Live or Will He Die'. It will be available on 26 November 26, 2012. Southern Comfort stars Keith Carradine (Cowboys and Aliens) and Powers Boothe (Avengers Assemble) and features an exceptional score by guitarist Ry Cooder. A must have for all film films.